In what undoubtedly would have been an extremely traumatic time for young 8 year old Sam, on 10 Oct 1865, younger brother Thomas died for reasons unknown.3 Then, on the 23 Nov, about a month before Sam's 9th birthday, his father passed away from diphtheria (written as Cynanche Laryngea Maligna),4 a very contagious disease that causes severe solidifying inflammation of the throat that leads to suffocation. This was followed two days later by his brother Joseph Frederick's untimely death.5 Within a span of two and a half months, a family of ten was cut to seven, leaving widowed mother Elizabeth to pick up the pieces and carry on. (It is now believed that all three family members died of diphtheria). 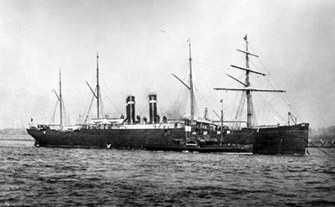 Here they boarded the Inman line steamship "City of Chicago" and made the roughly 10 day journey to America.10 (3 months later the steamer wrecked off the coast of Ireland in heavy fog on a return voyage to Liverpool: the only loss was the steamer itself after 9 years in service). Sam and Lizzie spent the rest of their lives in Columbia Station where they struggled to get by raising their children. 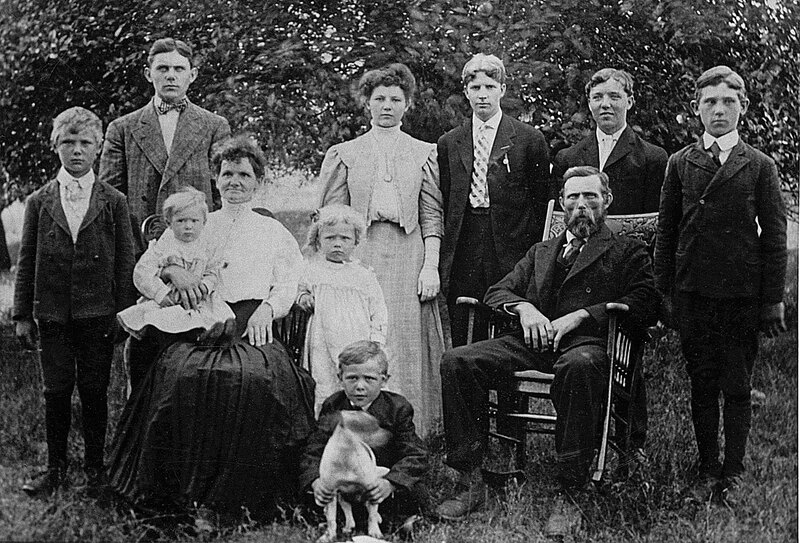 Sam was listed as a general farmer and the family had no money.13, 14 They were so poor that their son George would tell stories to his children and grandchildren about not owning a pair of shoes until his boss purchased him a pair at 15 years old. (Family also believes George was out of the house and looking for work by the age of 12). 1 "England and Wales Birth Registration Index, 1837-2008," database, FamilySearch (https://familysearch.org/pal:/MM9.1.1/2NH6-NWN : accessed 4 July 2015), Smauel John Rogers, 1857; from "England & Wales Births, 1837-2006," database, findmypast (http://www.findmypast.com : 2012); citing Birth Registration, Stone, Staffordshire, England, citing General Register Office, Southport, England. 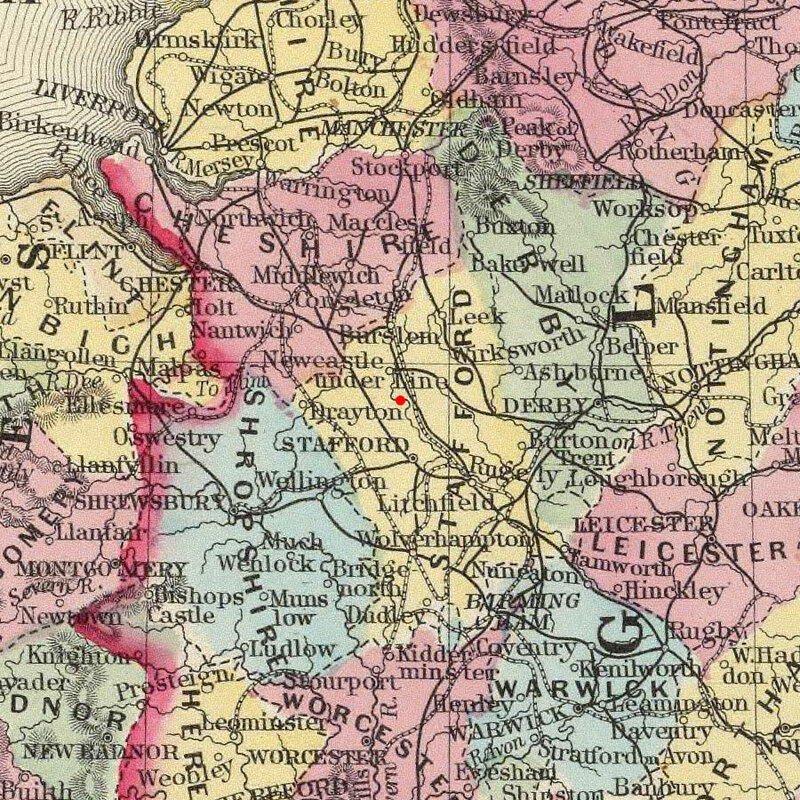 2 "England and Wales Census, 1861," database, FamilySearch (https://familysearch.org/pal:/MM9.1.1/M71V-MY2 : accessed 4 July 2015), Samuel J Rogers, Trentham, Staffordshire, England; from "1861 England, Scotland and Wales census," database and images, findmypast (http://www.findmypast.com : n.d.); citing PRO RG 9, The National Archives, Kew, Surrey. 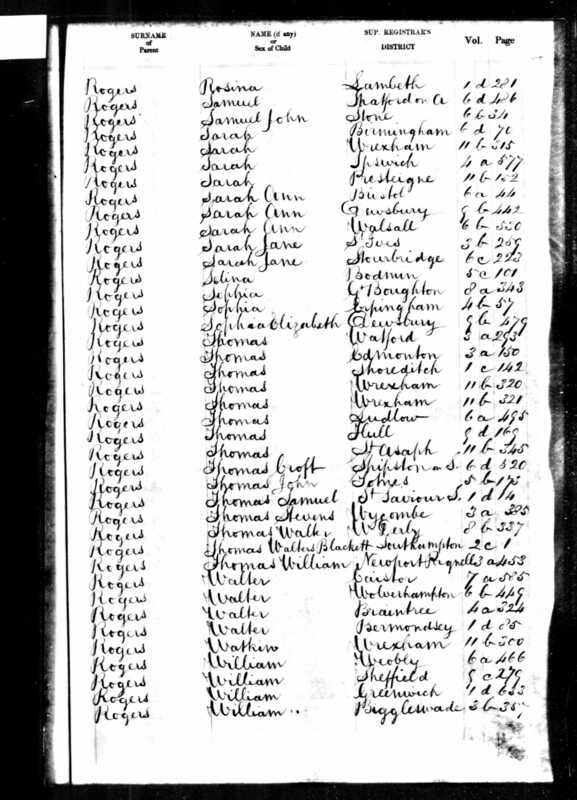 3 "England and Wales Death Registration Index 1837-2007," database, FamilySearch (https://familysearch.org/ark:/61903/1:1:2NGR-WW6 : accessed 5 July 2015), Thomas Rogers, 1865; from "England & Wales Deaths, 1837-2006," database, findmypast (http://www.findmypast.com : 2012); citing Death, Stone, Staffordshire, England, General Register Office, Southport, England. 4 "England Deaths and Burials, 1538-1991," database, FamilySearch (https://familysearch.org/ark:/61903/1:1:JD4L-QLQ : accessed 5 July 2015), Philip Rogers, 25 Nov 1865; citing , reference page 154; FHL microfilm 1,526,192. 5 "England Deaths and Burials, 1538-1991," database, FamilySearch (https://familysearch.org/ark:/61903/1:1:JD4L-QLW : accessed 5 July 2015), Joseph Frederick Rogers, 25 Nov 1865; citing , reference page 154; FHL microfilm 1,526,192. 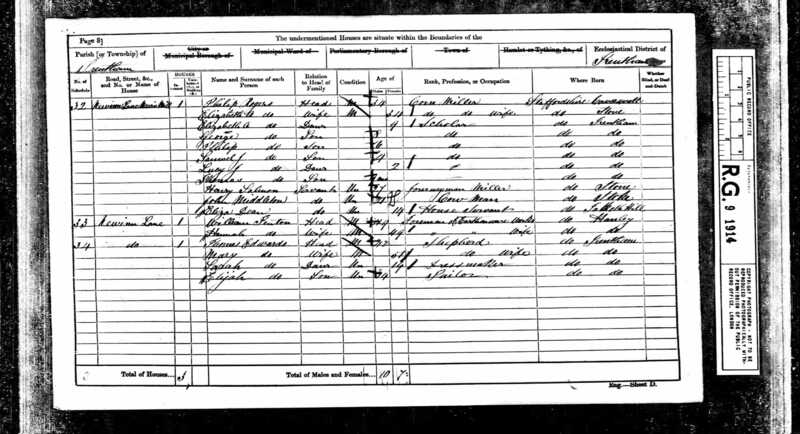 6 "England and Wales Census, 1871," database with images, FamilySearch (https://familysearch.org/pal:/MM9.1.1/V5TW-6SS : accessed 4 July 2015), Samuel J Rogers in household of Elizabeth A Rogers, Newinn Lane, Trentham, Staffordshire, England; from "1871 England, Scotland and Wales census," database and images, findmypast (http://www.findmypast.com : n.d.); citing PRO RG 10, folio 10, p. 13, Stone registration district, Trentham subdistrict, ED 7e, household 79, The National Archives, Kew, Surrey; FHL microfilm 836,372. 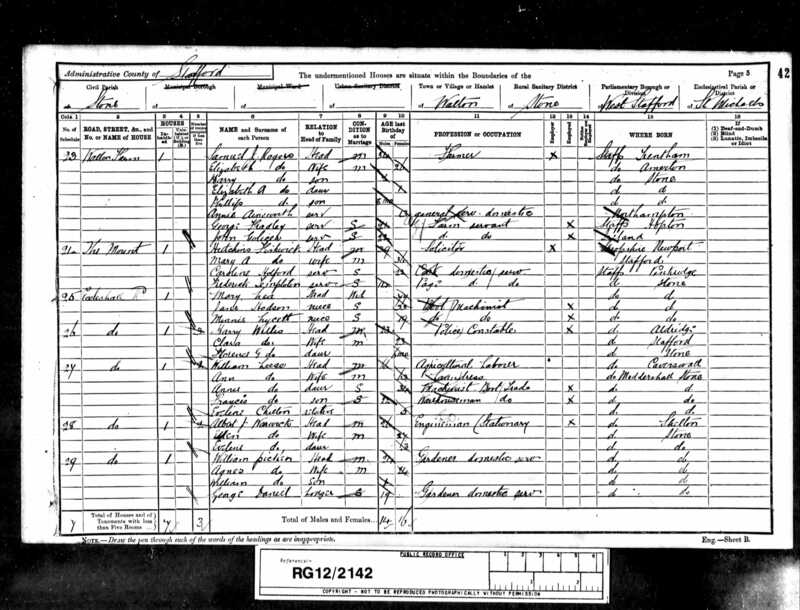 7 "England and Wales Census, 1881," database, FamilySearch (https://familysearch.org/pal:/MM9.1.1/X3VG-S32 : accessed 4 July 2015), Samuel J Rogers in household of Elizabeth A Rogers, Trentham, Staffordshire, England; from "1881 England, Scotland and Wales census," database and images, findmypast (http://www.findmypast.com : n.d.); citing p. 15, PRO RG 11/2696 / 144, The National Archives, Kew, Surrey; FHL microfilm 1,341,646. 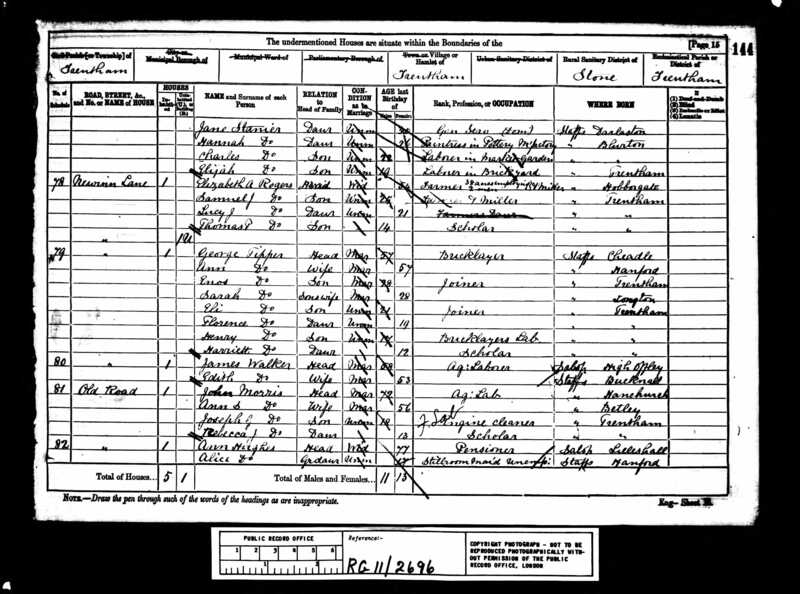 8 "England and Wales Marriage Registration Index, 1837-2005," database, FamilySearch (https://familysearch.org/pal:/MM9.1.1/2DYX-YCQ : accessed 4 July 2015), Samuel John Rogers, 1887; from “England & Wales Marriages, 1837-2005,” database, findmypast (http://www.findmypast.com : 2012); citing Marriage, Stafford, Staffordshire, England, General Register Office, Southport, England. 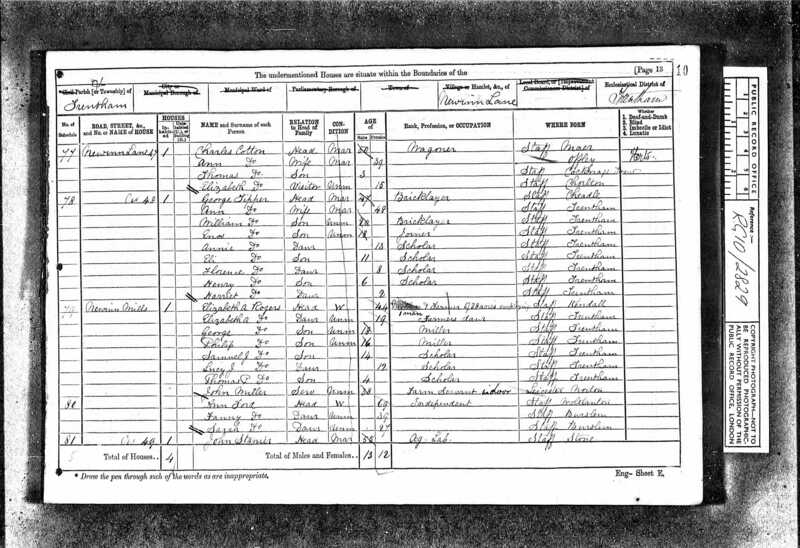 9 "England and Wales Census, 1891," database, FamilySearch (https://familysearch.org/pal:/MM9.1.1/WQG4-PPZ : accessed 4 July 2015), Samuel J Rogers, England; from "1891 England, Scotland and Wales census," database and images, findmypast (http://www.findmypast.com : n.d.); citing PRO RG 12, Staffordshire county, STONE subdistrict, The National Archives of the UK, Kew, Surrey. 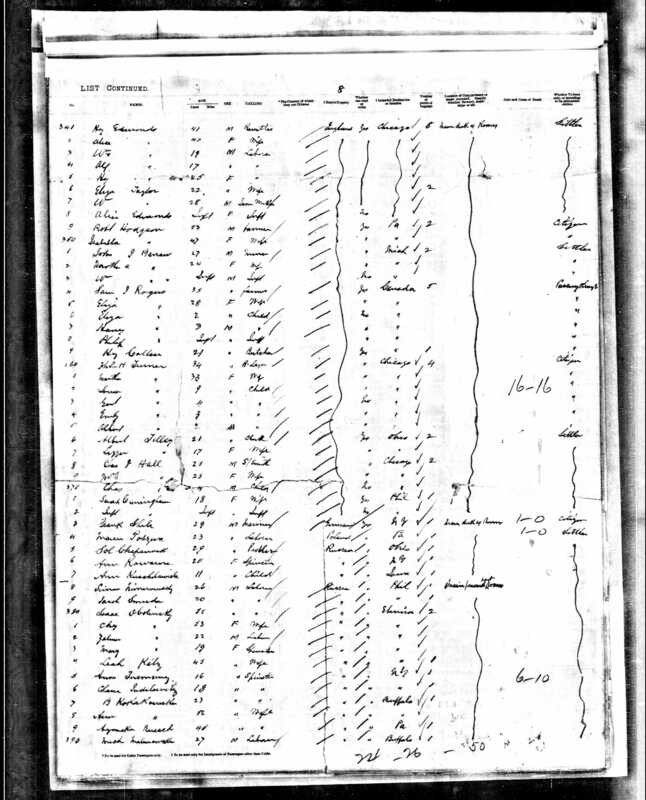 10 "New York, Passenger Arrival Lists (Ellis Island), 1892-1924," database, FamilySearch (https://familysearch.org/pal:/MM9.1.1/J6P2-V4Q : accessed 4 July 2015), Sam I Rogers, 26 Mar 1892; citing departure port Liverpool & Queenstown, arrival port New York, ship name City of Chicago, NARA microfilm publication T715 and M237 (Washington D.C.: National Archives and Records Administration, n.d.). 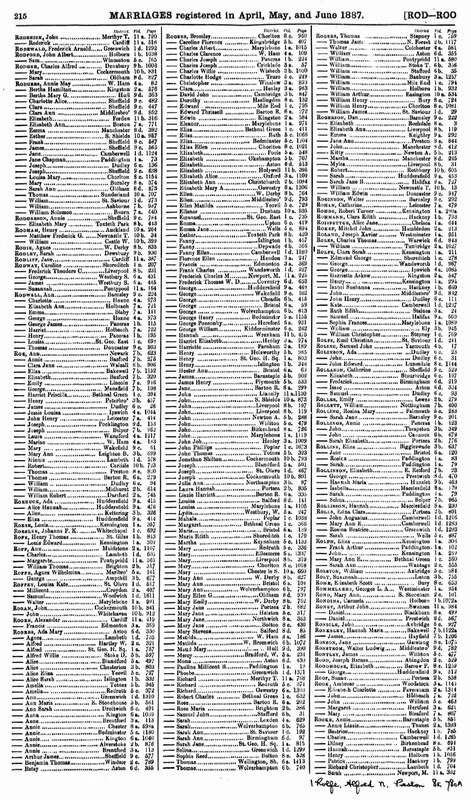 11 Death Notice for George Rogers, Sr.; The Cleveland Plain Dealer Newspaper; Thursday, 14 Sep 1972; pg 5-E.
12 "United States Census, 1900," database with images, FamilySearch (https://familysearch.org/pal:/MM9.1.1/MMDX-Y64 : accessed 4 July 2015), Samuel J Rogers, Columbia Township, Lorain, Ohio, United States; citing sheet 11B, family 249, NARA microfilm publication T623 (Washington, D.C.: National Archives and Records Administration, n.d.); FHL microfilm 1,241,295. 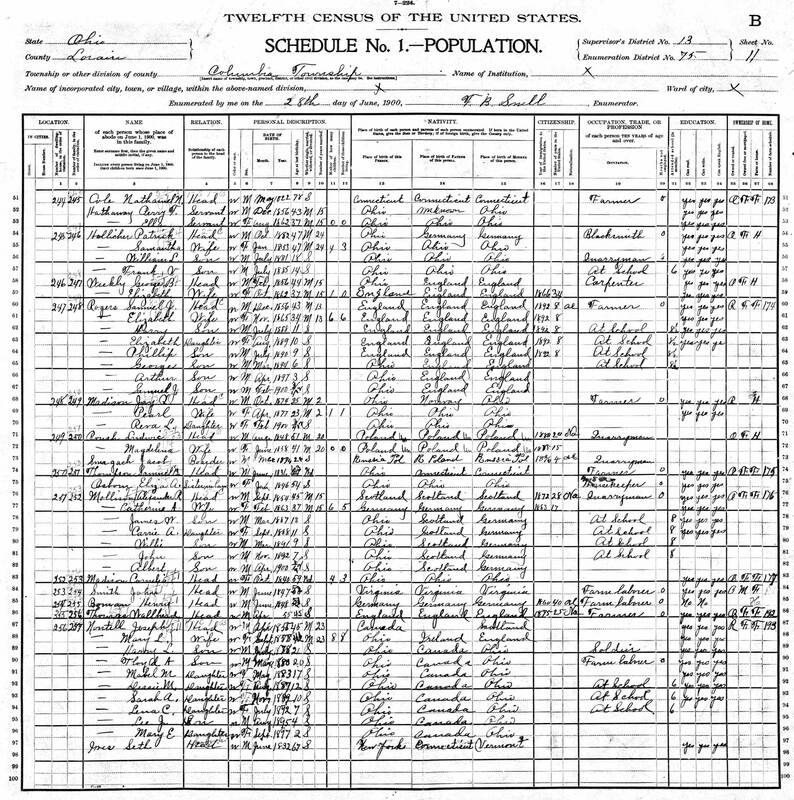 13 "United States Census, 1910," database with images, FamilySearch (https://familysearch.org/pal:/MM9.1.1/ML84-TRV : accessed 4 July 2015), Samuel J Rodgers, Columbia, Lorain, Ohio, United States; citing enumeration district (ED) 103, sheet 4B, family 95, NARA microfilm publication T624 (Washington, D.C.: National Archives and Records Administration, n.d.); FHL microfilm 1,375,219. 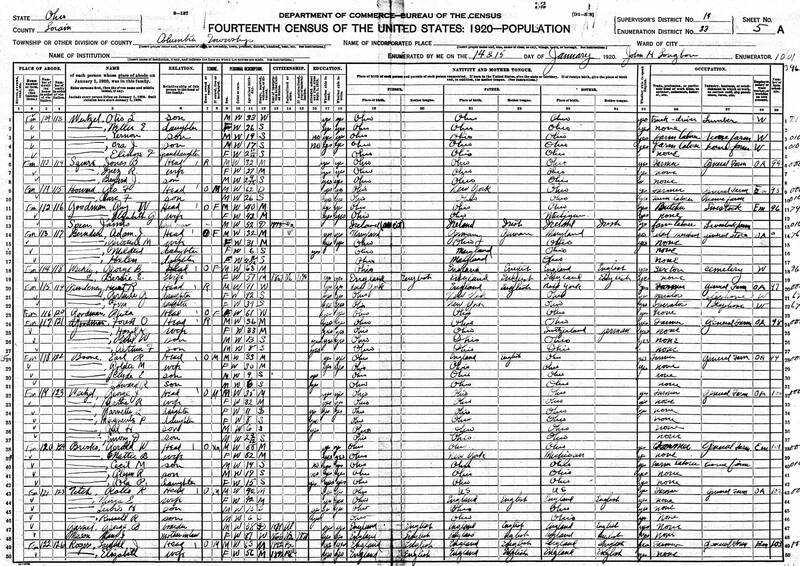 14 "United States Census, 1920," database with images, FamilySearch (https://familysearch.org/pal:/MM9.1.1/MD5Y-J5W : accessed 4 July 2015), Samuel J Rogers, Columbia, Lorain, Ohio, United States; citing sheet 5A, family 126, NARA microfilm publication T625 (Washington D.C.: National Archives and Records Administration, n.d.); FHL microfilm 1,821,406. 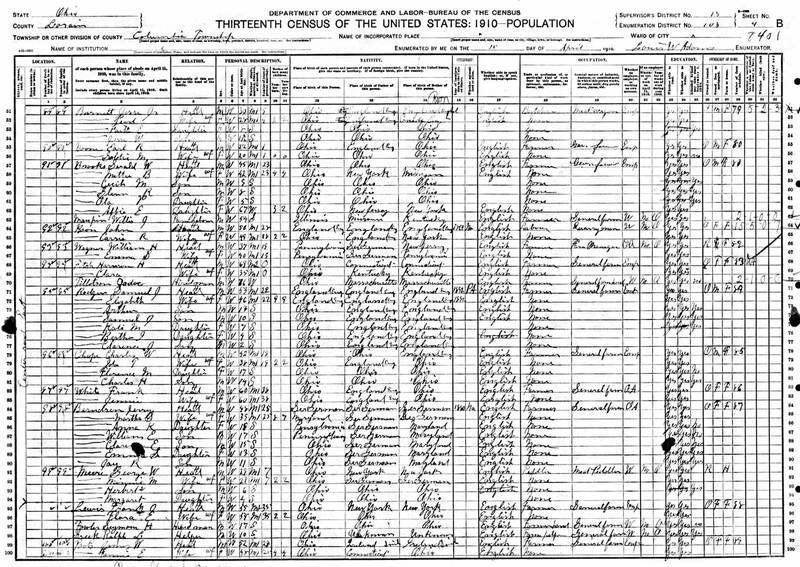 15 "Ohio, Deaths, 1908-1953," database with images, FamilySearch (https://familysearch.org/ark:/61903/1:1:X6HP-NMH : accessed 5 July 2015), Elizabeth Collin Rogers, 31 Dec 1929; citing Berea, Cuyahoga, Ohio, reference fn 75380; FHL microfilm 1,992,021. 16 "Ohio, Death Index, 1908-1932, 1938-1944, and 1958-2007," database, FamilySearch (https://familysearch.org/pal:/MM9.1.1/VKY8-FX4 : accessed 4 July 2015), Samuel J Rogers, 22 Nov 1930; from "Ohio, Deaths, 1908-1932, 1938-2007," database and images, Ancestry (http://www.ancestry.com : 2010); citing vol. , certificate number , Ohio Historical Society, Columbus; Ohio Department of Health, State Vital Statistics Unit, Columbus. 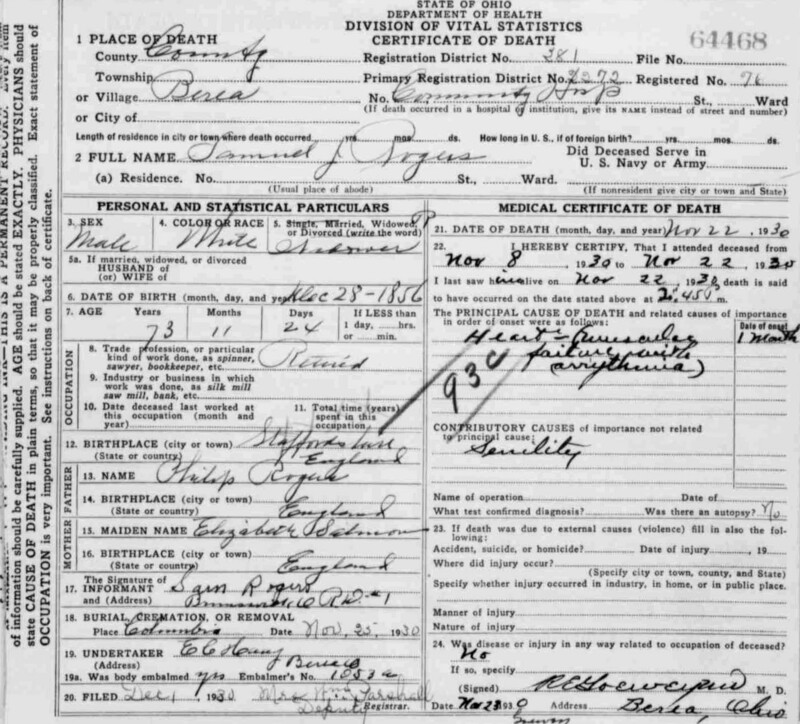 17 "Ohio, Deaths, 1908-1953," database with images, FamilySearch (https://familysearch.org/pal:/MM9.1.1/X8T2-K78 : accessed 4 July 2015), Samuel J Rogers, 22 Nov 1930; citing Berea Village, Cuyahoga, Ohio, reference fn 64468; FHL microfilm 1,992,277. 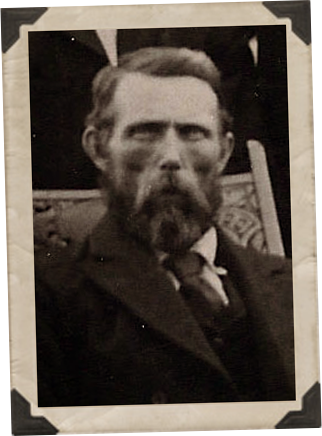 18 "Find A Grave Index," database, FamilySearch (https://familysearch.org/pal:/MM9.1.1/QVVW-X8Z5 : accessed 4 July 2015), Samuel J Rogers, 1930; Burial, Columbia Center Cemetery chanm, Lorain chanm, Ohio, United States of America, Columbia Center Cemetery; citing record ID 8846423, Find a Grave, http://www.findagrave.com.